Johnstone Farm discovered they could produce a variety of cut flowers well and sell them off the farm and at the Greensboro Curb Market. The cut flowers are a good companion crop to their blueberries. They averaged $100 a week from their cut flower sales. This was their first year and they think they will produce cut flowers another season and increase their customers next year and increase sales. The August 11, 2004 Cut Flower Farm Trial and Program was attended by fifteen people. The evening was raining but they came with umbrellas! The people that attended were serious about growing cut flowers commercially. At the program there was very good audience participation and discussions. The Reidsville Review Newspaper printed an article on the program. A blueberry farmer and I conducted an on farm trail of cut flowers. The flowers were to be a companion crop to his blueberries and be sold off the farm and at the Greensboro Curb market where he sold his blueberries. He had tried cut flowers before and they were very discouraged. 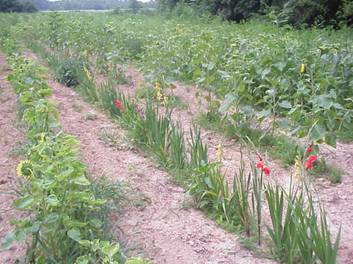 A Farm Trial Tour and Evening Program were held. 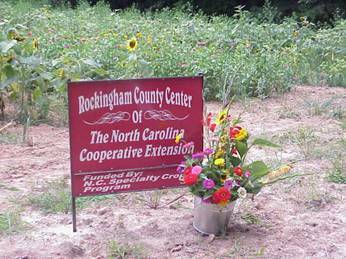 Dr. Carl Niedziela from NC A &T was conducting some Greenhouse Cut flower Trials in Rockingham County was added to the program. The site the farmer chose for the trial needed some pre-plant preparations. 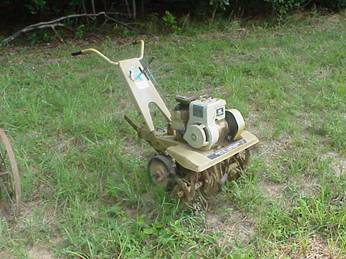 He hired a neighboring farmer to prepare the soil for direct seeding of flowers. Tom took a soil sample and applied fertilizer pre-plant and then twice more during the growing season. Wet weather delayed the first planting. The first planting of Glads was May 14, 2004 and annual seeds May 25, 2004. 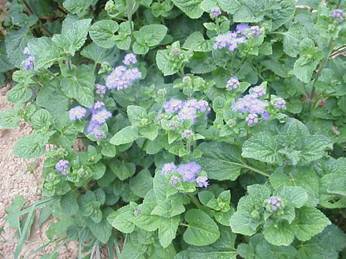 The second planting of glads, annual seeds, and ageratum transplants was June 14, 2004. The zinnias were sprayed with a fungicide three times during the season. 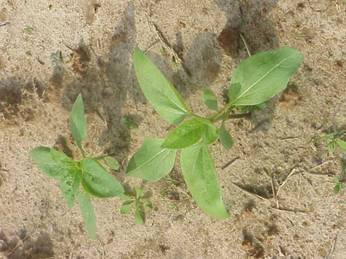 The herbicide Preen was applied to the rows as well as hoeing to control weeds. Since we used border glads no staking was required. The Rudbeckia seeds never germinated. The border glads, zinnias, pollen free sunflowers, and ageratum produced and sold very well. The earlier plantings produced larger numbers of plants, higher yields, and healthier looking flowers. 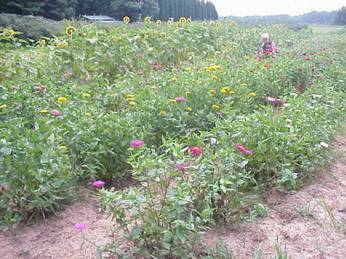 The Johnstones started harvesting cut flowers July 16th and sold at the Greensboro Curb Market for the first time July 17, 2004. They averaged $100 a week on flower sales. The flowers sold faster in already prepared bunches compared to single stem flowers. Tom and Deuard Johnstone were very impressed with the results of the trial both yield and sales. They plan to plant cut flowers again and make sure they have even earlier flowers to go with the blueberries. Other people who attended the field day and farm trial will produce more flowers too, especially the border glads that are longer than they expected. All the people at the program asked for grant money! I learned a lot about cut flowers and the selling of the flowers. The Program with Carl Niedziela from NC A&T on his greenhouse cut flower work was very informative too.